The convenience of an all-inclusive vacation package lures millions of travellers to beach resorts every winter, but staying off-resort can deliver a richer, more memorable travel experience. Explore the real Cuba with these suggested itineraries, and go soon—before restored diplomatic relations with the U.S. alter the enigmatic island forever. Make stunning Havana your base, and you’ll enjoy the best of both worlds: exciting urban sights and idyllic beach relaxation. 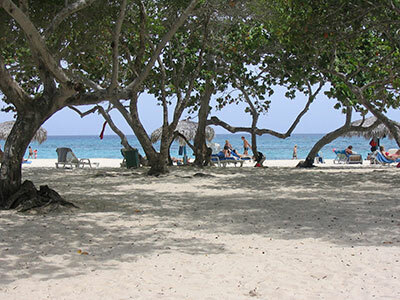 Just beyond the city limits lie the Playas del Este, a 15-kilometre chain of uncommercialized beaches that locals love. The best is Santa Maria. Take a shuttle bus from Havana’s Parque Central, departing every 30 minutes (a return ticket costs 5 CUC, about $5 CAN), or have a taxi drop you off for the day. For 40 centavos, and a truly local experience, take public bus 400 towards Guanabo beach. 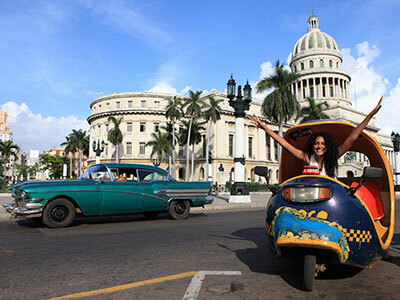 Return to your city centre hotel (or use Cuba’s version of Airbnb to book private accommodations: casaparticularcuba.org) in time for dinner and an obligatory stroll along the Malecón, Havana’s seaside boulevard. Worn, magnificent colonial Spanish architecture from the sixteenth century lines the eight-kilometre boulevard (and a few of these grand buildings also house restaurants and bars) while classic cars stream by. When the sun goes down, the Malecón becomes a hub of social activity, with all ages hanging out and enjoying the unspoiled bay view—the marine traffic that typically clogs major ports is conspicuously absent here. Along with requisite visits to the rum museum, cigar factory and Hemingway sites, can’t-miss Havana attractions include Plaza de Armas, Plaza de la Catedral and Plaza Vieja; the Capitolio; Old Havana historic district; and Plaza de la Revolución. Art lovers will thrill at the Museo Nacional de Bellas Artes, and cocktail connoisseurs will sip happy at the Hotel Nacional’s legendary garden bar, overlooking the ocean. Spectacular beaches such as Playa Esmeralda, Playa Pesquero and Guardalavaca make Holguín province Cuba’s third most-popular tourist destination, with excellent diving and snorkelling in warm, calm, turquoise waters. Stay in the capital city at the Soviet-style Hotel Pernik, or book a casa particular for an authentic experience of daily life in Cuba, and take a side trip to the gorgeous coast. Holguín is nicknamed the “city of squares” for its many picturesque, historic plazas; it also boasts a number of small museums to peruse, including the history and natural science museums. The Frank Pais International Airport serves the city of Holguín, with domestic flights available from Havana or Santiago de Cuba. History buffs should stay in the picture-book town of Trinidad, a beautifully preserved UNESCO World Heritage Site in central Cuba, founded in 1514. 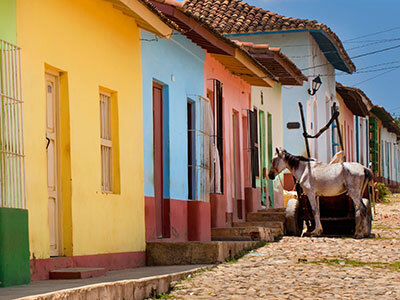 With its calm atmosphere, pleasant pace, cobblestone street and pastel-coloured mansions, Trinidad offers a unique way to experience a traditional Cuban lifestyle in a compact area you can explore on foot. There’s also an incredible selection of casas particulares (over 400 and counting), many small museums and music venues, and a recent boom on the dining scene. Lying on a beach near Trinidad is very easy too: white sand and blue water await you at nearby Playa Ancón (a glorious, seven-kilometre ride from Trinidad). Less than 20 kilometres from Trinidad, you’ll also find Topes de Collantes, a natural reserve and one of Cuba’s premier ecotourism centres. Scenic hiking routes, horseback riding, swimming and waterfalls are just a few of the things to do and see in this enormous (200-square-kilometre) park. Stay in one of the mountain area’s spa hotels, and be sure to stop at the stately Museo de Arte Cubano Contemporaneo—which opened in 2008 on the main road through Topes de Collantes—to view paintings, sculptures and prints by leading Cuban artists. Fly into Havana, and catch a Viazul bus to Trinidad or rent a car (by car it’s about three and a half hours between the two cities). For more non-resort vacation ideas and itineraries, call the Cuba Tourist Board in Toronto at 416-362-0700. Whether your trip will be all-inclusive or non-resort, get a free RSA Travel Insurance quote here.